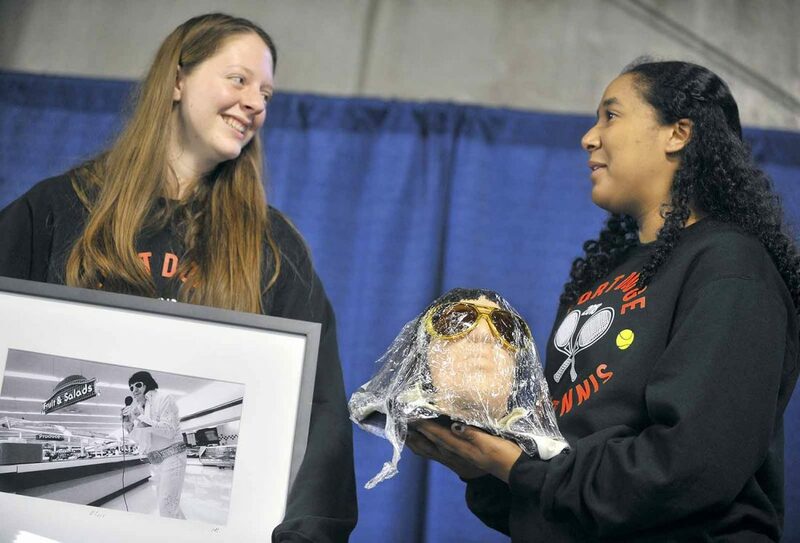 Raelle Wilder, 16, at right, nervously holds onto an Elvis head cake during the live auction at the 23rd annual Domestic Sexual Assault Outreach Center Cake Auction at the Iowa Central Community College East Campus in 2018. Her fellow Fort Dodge High School Tennis Team member Kathryn Cochrane, 16, at left, got to hold a photograph of The King. The package also included an Elvis lunch box. 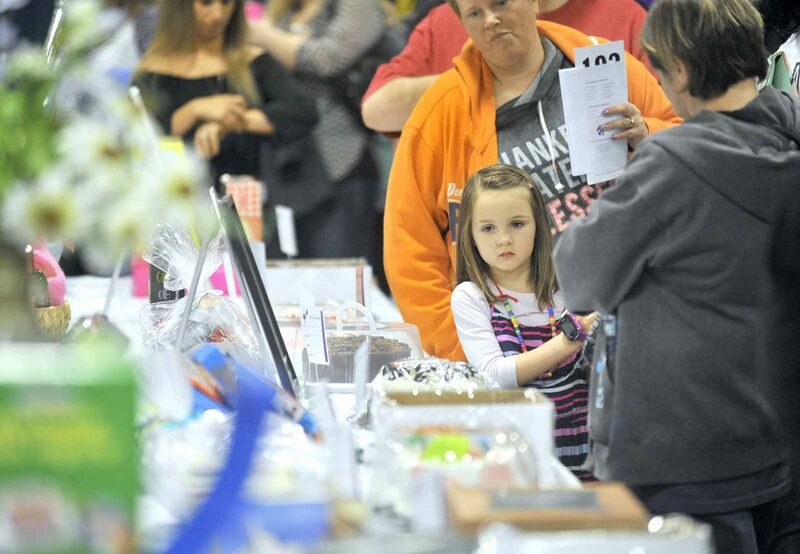 Fia Hill, 5, of Fort Dodge, looks over some of the many cakes available Saturday evening during the 23rd annual Domestic Sexual Assault Outreach Center Cake Auction at the Iowa Central Community College East Campus in 2018. 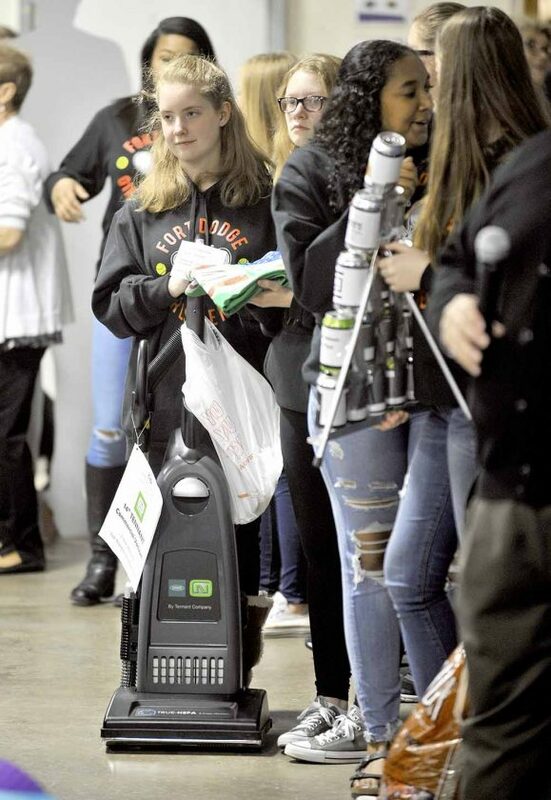 Jessica Jordison, 16, holds onto a vacuum cleaner Saturday evening that was sold during the live auction at the 23rd annual Domestic Sexual Assault Outreach Center Cake Auction at the Iowa Central Community College East Campus in 2018. 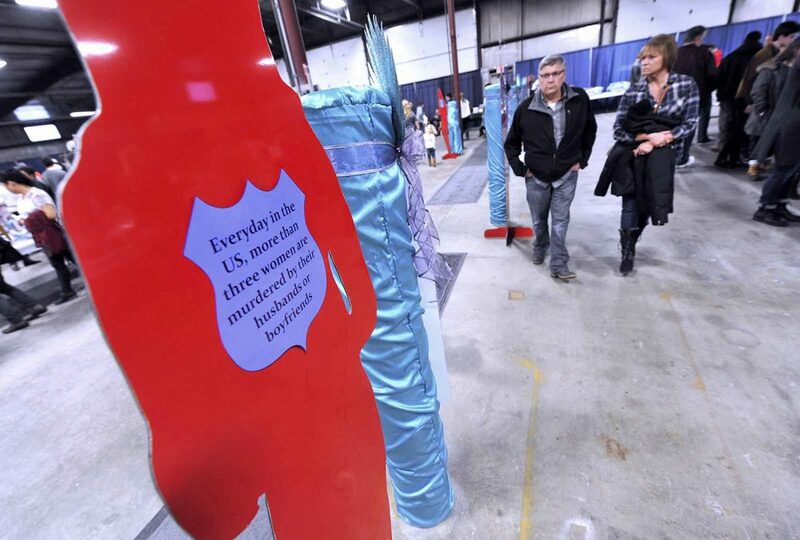 Some of the red silhuettes honoring victims of domestic violence were on display at the 23rd annual Domestic Sexual Assault Outreach Center Cake Auction at the Iowa Central Community College East Campus in 2018. Cakes are being baked, raffle tickets are being sold and auction items are being organized in preparation for the Domestic/Sexual Assault Outreach Center’s annual Cake Auction. 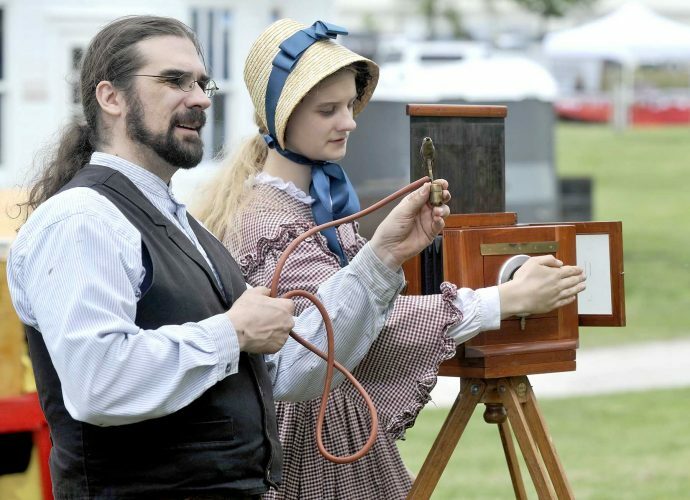 The 24th annual event will be held Saturday at the Iowa Central Community College East Campus, 2031 Quail Ave. Admission is free and doors open at 5 p.m.
Leah Bair, program development director for D/SAOC, said both a live and silent auction will be held this year. There will be grab bags and free appetizers. There will also be raffle drawings for two prizes. New to the auction this year is a wheel of prizes. There are also a variety of silent auction items, which include toys, games, furniture, tickets to sporting events and weekend getaways. While it may sound like an ordinary auction, there’s something big that sets the Cake Auction apart from others: each prize is paired with a cake. Bair said some people get the mistaken impression that the auction is a cake walk, but that’s not the case. The Cake Auction is D/SAOC’s biggest annual fundraiser. Last year, more than $60,000 was raised. Bair said that’s even more impressive when remembering that there was a snowstorm going on during last year’s auction. She attributed its success, despite the weather, to the dedication of D/SAOC’s supporters. The money raised at the Cake Auction goes to support D/SAOC’s operations and mission. Not only will the Cake Auction be raising money for the shelter and its services, but it will also be commemorating Crime Victims’ Rights Week, which is April 7 through April 13, the day of the auction. Marie Harvey, supervisor of D/SAOC’s Homicide/Other Violent Crimes Program, said this year’s theme is Honoring Our Past, Creating Hope for the Future. “The whole theme is to help celebrate progress made by those before us as we look to the future of crime victim services that is even more inclusive, accessible and trauma-informed,” Harvey said. To recognize the week, Harvey said there will be an awareness display at the Greater Fort Dodge Growth Alliance, as well as posts on D/SAOC’s Facebook page. There will also be a booth at the Cake Auction itself, along with cardboard silhouettes that bear the names of people who died in acts of violence. Harvey said there are several months throughout the year honoring victims of crime, but Crime Victims Rights Week is for victims of all crimes. “This highlights one specific week each April to where it encompasses all crime victims and the struggles that they have gone through to get to where they are now, and all the changes as far as advancements of victim rights,” she said. Anyone interested in donating an auction item or a cake can contact Bair at 955-2273, or reach out to any D/SAOC staff member.